MSW generation rates are usually influenced by economic development, degree of industrialisation, public habits and local climate. Generally, higher the economic development and rate of urbanisation, the greater is the amount of solid waste produced. Income level and urbanisation are highly correlated. With increasing disposable incomes and living standards, consumption of goods and services correspondingly increases, so does the amount of waste generated. Urban residents produce about twice as much waste as their rural counter parts. Nearly 62 million tonnes of total waste is generated annually in India. Out of this, plastic waste is 5.6 million tonnes, biomedical waste is 0.17 million tonnes, hazardous waste is 7.90 million tonnes and e waste is 1.5 million tonnes. Consequently, per capita waste generation in Indian cities ranges from 200 grams to 600 grams per day. MoEF has also forecasted that waste generation will increase from 62 million tonnes to about 165 million tonnes by 2030. Such huge amount of waste generation poses a hazard not only to the environment but human health and development. Waste results in accumulation of greenhouse gases(GHGs) primarily Carbon Dioxide (CO2), Methane (CH4) and Nitrous Oxide (N2O) which are responsible for global warming and climate change. Increased emission of these gases has resulted on rising global temperatures thereby raising sea levels and change in precipitation and other local climate conditions. Scientists predict that there will be an overall trend toward increased precipitation and evaporation, more intense rainstorms and drier soil. Changing regional climates are expected to alter forests, crop yields and water supplies. This could also affect human health, animals and many types of ecosystems. Deserts might expand into existing rangelands and features of some of our national parks might be permanently altered. In such a scenario managing wastes is not only a solution but is also a need of the hour. Recycling is an integral part of any waste management system as it represents a key utilisation alternative for reuse and energy recovery. Reuse requires a minimum functionality that reconditioning can be accomplished within certain costs and time limits. Recycling only requires a single material waste stream of acceptable purity and a WTE facility is able to process any waste for energy recovery as long as it is not contaminated with hazardous substances. To meet these requirements the different waste streams (e.g., municipal solid waste, industrial waste, pharmaceutical waste, etc.) must be treated differently. The rise or fall of a waste management system highly depends on the support of the residents and employees. They take the first step in a long chain of processes by separating their waste stream in direct reusable or recyclable waste streams (e.g., paper, plastics, glass, etc.) and waste that can be used as a fuel for energy recovery. Solid waste management rules has been revised by MoEF. The concept of partnership with Swachh Bharat has been introduced. Bulk and institutional generators, market associations, event organisers, hotels and restaurants have been made directly responsible for segregation and sorting the wastes in partnership with local bodies. Life-Cycle Assessments (LCA) can help to decide whether it is sustainable either to reuse or recycle certain waste streams or to recover the energy only. LCA is a comparative methodology used to determine the environmental impact and energy or resource consumption of products and services over their whole life cycles (extraction of the raw materials, production of the product itself, use of the product and treatment after disposal as waste). Any utilisation strategy that consumes more resources and energy or has a greater environmental impact then the initial production from primary raw materials is considered ‘non-sustainable’. 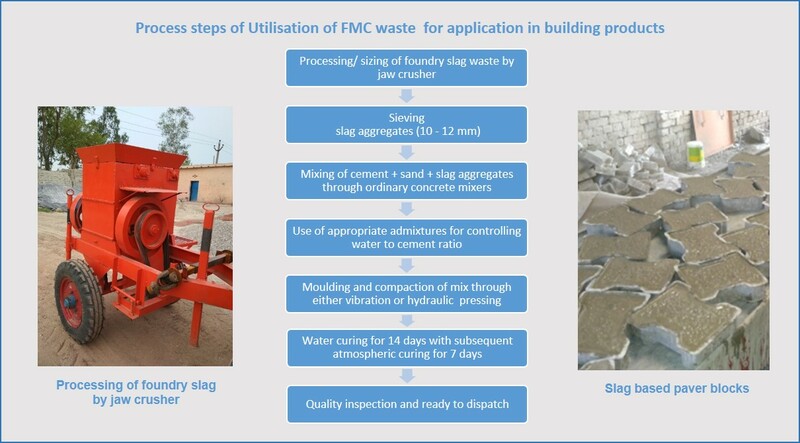 In order to achieve higher resource efficiency, significant efforts have been made to utilise various mining and industrial wastes into sustainable building products. The area of waste-utilisation has thus revealed a new dimension of modern scientific research.